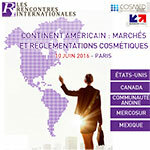 On Friday 10 June 2016, in Paris, Cosmed and Business France are organising a day devoted to the international regulation of cosmetic products on the American continent. Business France's export advisors will present the growth markets, opportunities and pitfalls to avoid in each market. Then expert speakers will present by zone the regulation of cosmetic products and the latest developments. France is the leading supplier of cosmetic products to the American continent. However, this industry, which is one of the most dynamic and innovative, has to adapt to major regulatory differences between the countries in the region. The cosmetic regulation and the expected publication of a new text extending the FDA's powers will be addressed by Linda Katz, Director of the FDA's Office of Cosmetics and Colors. Craig Weiss of CPTC Labs will also focus on sunscreen regulation and the Sunscreen Innovation Acté. Indeed, the publication of guidelines at the end of 2015 should enable new sun filters to be put on the market. Canada Frédéric Lebreux of Biorius will provide a comprehensive overview of the regulations in Canada and detail the latest amendments to the list of permitted substances. Marcelo Aguilar, Secretary General of the CAN, will take stock of regulations in the Andean Community. Ms Renata Teixeira, from the Associação Brasileira da Indústria de Higiene Pessoal, Perfumaria e Cosméticos (ABIHPEC), will detail the projects currently being published, in particular on sunscreens, registration of cosmetic products and preservatives.